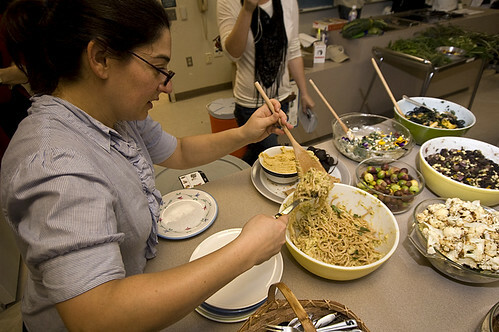 Marney Weinstock, a dietetics major, tastes the vegetarian dishes she helped prepare during the Veggie Iron Chef in Burk Hall on Oct. 24th, 2011. Photo by Rebekah Didlake. SF State, with the cooperation of its organizations and departments, began promoting environmentally friendly lifestyles through events and awareness for Sustainability Week, which began Monday. Transforming SF State into a more environmentally friendly campus has been priority since 2007 when President Robert A. Corrigan signed the American College And University Presidents’ Climate Commitment. This year the campus was named one of the greenest in the country by the Princeton Review in part because of the Climate Action Plan that was drafted in 2009. In order to achieve the goals of the CAP and to raise awareness among students and faculty, Physical Planning & Development, the Dietetics department and ECO Students put together a series of on-campus events focusing on how to live a lifestyle that isn’t damaging to the natural surroundings. Liza Sternik, student sustainability coordinator at SF State, has been helping to plan Sustainability Days since she started working for the PP & D in September. “Having sustainability in the curriculum and in the school environment is so crucial for our future generations to be able to fully understand the problems and the issues that are facing this world, I think for me is the most important thing,” said Sternick. Monday was Sustainable Food Day, where activities promoted eating more organic and locally-grown produce along with meat that has been raised in a healthy and humane environment. Michelle Gallemore is a 24-year-old environmental studies junior and campaign co-chair of ECO Students. “San Francisco being a progressive city, we need to have a progressive school as well and we need to be proactive instead of reactive,” Gallemore said. Davin Wentworth-Thrasher, technical services coordinator at SF State, helped put together the veggie iron chef contest. Four groups of students competed to make a variety of vegetarian side dishes from the vegetables donated by local farms. “What we’re really trying to do in a gentle way is talk about the values of reducing meat consumption and make it a fun social space,” Wentworth-Thrasher said. The planned photo petition gave students a chance to write their individual reasons for wanting more organic and sustainable foods at the University on a white board and the have their picture taken with it. This is a part of a photo petition that will be posted on the internet and potentially be used in the future to lobby for healthier food on the campus, Sternik said. “If we want to change our food policies on campus at SF State, to have that community, student support is very important,” Sternick said. Tomorrow is Campus Sustainability Day, which includes two education sessions about compost and recycling and a clothing swap. Students can help improve the campus by joining the Volunteer Work Park Thursday by the science building on 19th Avenue, where they will be rolling out native meadow grass.